I recall that in the 50s much hard earned money went up in smoke; Woodbine, Player and Capstan product, ejected by human fireflies, drifted upwards with much of it caught in the film projector beam like curling vapour trails from caught out Luftwaffe planes. By and large the cinema going public was not aware of the dangers of cigarette smoking, not that the industry that produced fags was ever going to tell that generation the full facts! My memory tells me that the film stars of the 50s were for ever lighting up and using fags as a prop; impressionable minds were persuaded that cigarettes were swish and cool. We are aware of the dangers now and consequently consumption has gone down in the UK, but that is not a great problem for the tobacco industry; its global results no doubt delight its shareholders and perhaps one or two hard bitten funeral directors. Um… on reflection is there such a thing as a hard bitten funeral director? Perhaps not. The one I met a couple of years ago, when my car broke down, was ever such a nice lady. Getting a lolly in the Empire at the interval depended on two things: did I have the money to buy one and if so was the queue short enough to make the effort worthwhile? Which leaves me with a bit of the other; I was pre-teen so a bit of the other was a mystery that failed to register on my radar but many couples saw the period of comparative darkness as an opportunity to indulge in some back row recreational fun, the extent of which, at the time, was beyond my wildest contemplations. Sheila Marr and Alan Spence, both teachers at Ushaw Moor County school, tied the knot in March 1959. Our class presented them with some new knives and forks and they probably found that gesture quite touching! Can anyone recall these teachers? 4] The Coalminers Of Durham – Norman Emery – The Northern Echo wrote ‘a finely illustrated book by a mineworker’s son’. 5] Vietnam – Christian G Appy – the definitive oral history told from all sides. The site has gone a bit quiet and time is running out; it makes me wonder whether glitter is in demand and worth ‘fighting’ for! We shall see what we shall see. Remember primary school? Your mum had already tied your shoelaces before you set out for school but what about when the laces unravelled? I suppose the teacher retied them for you. Now, the big question: did your mother or teacher tie them correctly? If you go to TED via google Terry Moore will show you, in a very short video, how to tie them properly. I looked at it and have gone for his method! It took me five minutes to master the task but you will probably achieve it in one minute. Being left handed I found it a touch complex, hence the five minutes; that’s my take on it and I am sticking to it. The Eagle, Charlie Buchan’s Football Magazine, The Dandy….. They were part of my childhood back in the 1950s. If you are so inclined you can read the September 1951 edition of Charlie Buchan’s magazine by googling – Charles Buchan’s Football Monthly Archives. It’s at the top of the page of sites. Once in the site itself look to the right hand side and click to another era of football. There is a picture of Newcastle United, a feature on Raich Carter and much more. Does The Surname Marchant Mean Anything To You? J Marchant served in the Royal Navy Voluntary Reserve and was awarded the MM [Military Medal] in 1917 for bravery in battle; the records show that he came from Ushaw Moor. It is quite possible that his family lived at 25 South Terrace Waterhouses in 1901 – parents being Billy and Martha. No less than thirteen people lived in that house on the night of the census and our medal winner may have been James [ten years old in 1901], or John [six in 1901] or Joseph [22 in 1901]. Perhaps Joseph is the least likely contender owing to his age but I could easily be wrong about that. Are you associated with this family? If so have you any memories to share? Ushaw Moor Voted the Worst Village In Britain? Too often we get tacky taste and downright drivel on the internet; let me direct you to some, just for a moment. 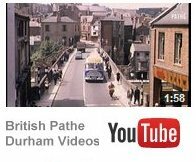 Google – NUFC Ushaw Moor – and you will find it. Amongst the slime you will find a very good account of Ushaw Moor and its history which helps towards redressing the balance. When and where did the so called vote take place? NUFC? It was Newcastle United FC that relied for a century on some of Ushaw Moor’s football fans for important revenue. No doubt the club itself has nothing to do with the site in question. Ushaw Moor helped to fuel the Industrial Revolution and revitalize the economy. Too many of its people died in the process and that is not counting those that died in two World Wars. There are lots of places inferior to Ushaw Moor and one prime example is Blackpool. I love Blackpool Football Club almost as much as I love Derby County but let me tell you that I would rather live in Ushaw Moor than Blackpool. Yes I know Blackpool is a town and not a village.